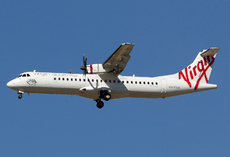 Virgin Australia flight VA660, an ATR 72-600, suffered flameouts in both engines on a flight from Sydney to Canberra, Australia. While the aircraft was descending through 11,000 ft in heavy rain, the right engine’s power rolled back (decreased) and the engine flamed out. The engine automatically re-started within five seconds. The descent continued and, while passing through 10,000 ft, the left engine’s power also rolled back and that engine flamed out before automatically relighting. The crew selected manual engine ignition for the remainder of the flight and the landing. The aircraft re-entered service on December 17.